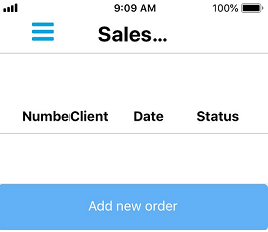 Navigate to the Sales Order screen (Figure 1). Click Add New Order (Figure 1). 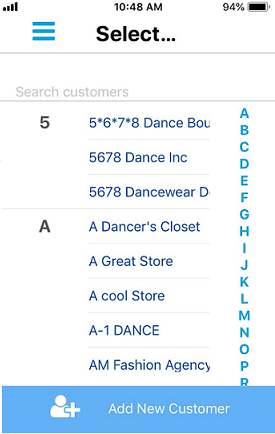 Begin to type the name of your customer in the Search Customers field (Figure 2). If you need to add a New Customer, please see Mobile App Customers Knowledge Article for more information. 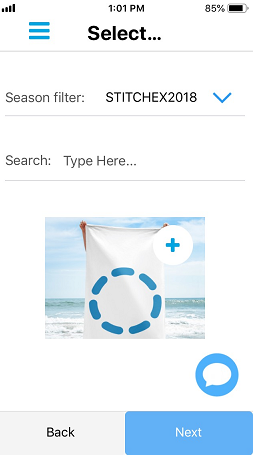 Swipe up to scroll and browse for the product within the selected Season that you would like to purchase (Figure 4). These product display order is based on what you have configured in Settings>Product Setup>PRODUCTS ORDER BY section. If you make a change to this setting, you may have to uninstall/reinstall the Mobile App in order for the new display order work. 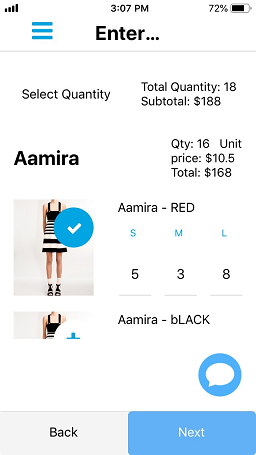 Click on the product in order to bring up the Color and Size selections (Figures 5 & 6) where you can specify the quantities of that product you wish to purchase. After selecting the Sizes and Color for your product, browse for another product. Use the "Back" button to back up a screen or two and select a different Season or product. Keep performing this until you have selected all of your products, sizes, colors and quantities. See next sections on entering quantities for the sizes and colors and finalizing the order. For those products that have specific sizes, you also specify the quantities as shown below in Figure 6. In this example, we specified a quantity of 5 for small, 3 for medium and 8 for large. 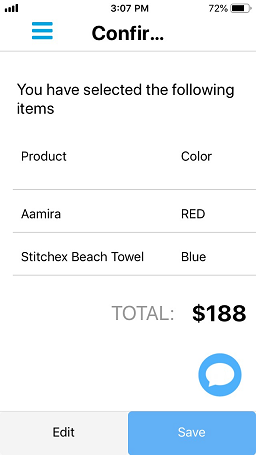 If you click "Next" and received this error message, you did not proper enter the quantities for your color and sizes for your products (Figure 7). 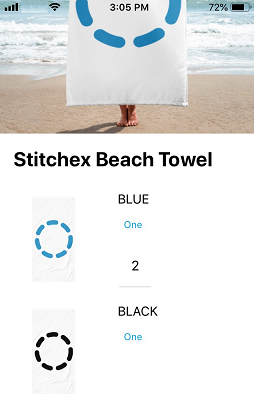 Once you selected all of your products and have clicked on the "Next" button in Figure 7 (with no errors reporting), Stitchex will take you to a summary screen to show you what you have selected (Figure 8). If this is correct, click SAVE. If it is not correct, click EDIT. 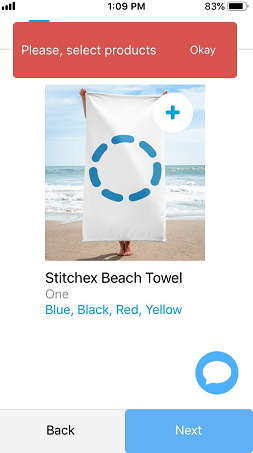 Once you click Save, your order will be sent to Stitchex. 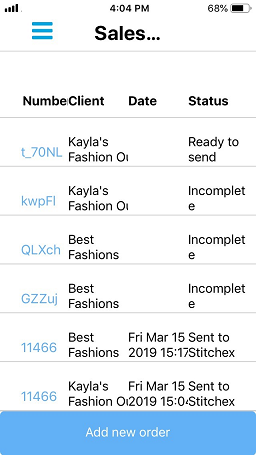 You can see on your Display Order list which ones are still in DRAFT state, which ones have not been finalized and which ones which ones have been sent to Stitchex (Figure 9). For the order with a status of "Ready to Send", the "Save" button was never selected (Figure 8) to finalize the order. For the orders with an "Incomplete" status, no products were added. We can edit the orders and add products later. For the last two at the bottom with 11466 Numbers and "Sent to Stitchex" status updates, those were sent to the Stitchex system. All orders received from Mobile Devices remain in DRAFT State until confirmed. 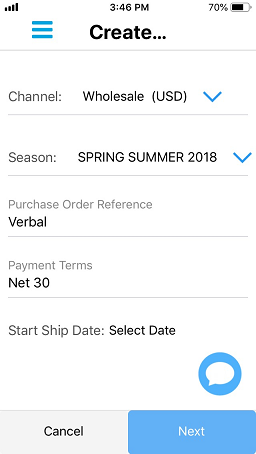 You can tell which orders are received from mobile devices by going to your Sales Order screen as they will have a mobile device icon next to the DRAFT word in the Status column (Figure 10). (Note: This image was from the PC version of Stitchex, not the Mobile App).